In a first of its kind review, Consumer Reports tested four partially automated driving systems and ranked GM’s Super Cruise as the best of the lot. According to Consumer Report, Super Cruise edged out Tesla Autopilot and made it to the number one spot because it did the best job of balancing technology while also making sure that the driver is paying attention. Consumer Reports compared four different systems to evaluate the performance of self-driving tech available in today’s cars. CR also tested how effective these systems were in monitoring driver engagement and the actions they took in response. CR’s testers drove these cars multiple times over the same route, on CR’s 327-acre Auto Test Center track and also in Connecticut freeways, as a leading vehicle, and as the following vehicle. Why CR Tested only these four systems? Why GM was the best? 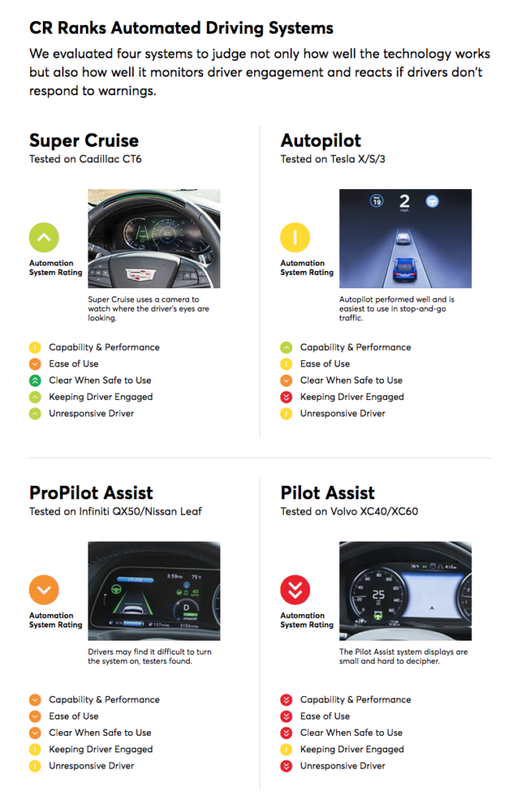 GM raced to the top spot because it’s Super Cruise did the best job in monitoring driver engagement. Powered with an eye-tracking software Super Cruise monitors driver’s attention by using a small camera and alerts the driver when they need to pay more attention or take back control. When Super Cruise identifies that the driver is not paying attention, it warns the driver with a red warning light on the steering wheel, vibrates the seat along with a highly audible alert. If the driver does not take back control, then it starts to slow the car down. The monitoring and responding part is where Tesla scored poorly. Tesla Autopilot does not offer an eye tracking system. GM’s Super Cruise functions only on divided highways that are already mapped by GM. According to GM, the company has mapped more than 130,000 miles of freeway within 5 cm scan accuracy. Though Autopilot scored highly for its capabilities and ease of use, CR noted that Tesla allowed drivers to use Autopilot on small, curvy roads with poor lane markings and operated erratically in these situations instead of locking the system out. Nissan and Volvo systems performed poorly on curvy or hilly roads and were prone to frequent lane departures.